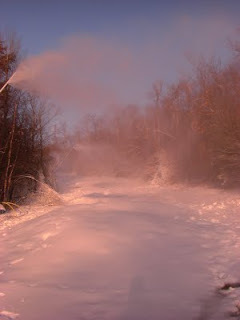 We have several productive days of snowmaking already this week - as you can see from this photo from this morning. That plus a predicted snow storm for Wednesday should put us in great shape for opening this weekend. For Saturday, December 12 and Sunday, December 13 we plan to open Top to Bottom with the following trails: Easy St., Gibson, Lower Gibson, Beginner’s Luck, Lucky Loop, South Slope, Snow Train/Lucky Pitch or Upper Beginner’s Luck, and Beginner Basin. We will plan to run the Quad, South, Lucky Loop, and Magic Carpet lifts. We will also open the lower tubing park with two runs and the handle tow lift. If snowmaking progresses well we may also be able to add Upper Schneider and Artist Falls. Stay tuned. Ski Area Operating Hours will run from 8:30am to 4pm on Saturday and Sunday. Tubing from 9am to 4pm on Saturday and Sunday. Please note that we will close Monday through Thursday (Dec. 14 to 17) for snowmaking and reopen for daily operation on Friday, December 18 (Ticket Rollback Day - $3.30 tickets). We will be offering a special discounted lift ticket rate for the weekend of Dec. 12 and 13; $39 for adults, $31 for teens and $24 for youths. Tubing will start at full price: $22 for two hours. We will offer a Learn to Ski or Ride package for $89 for ages 6 and older. All lessons will be private. For those looking just for lessons without a package, one hour privates will be available for $60. Special lesson options for children 5 and under will be made on a case by case basis for our first weekend. Daycare will be open. Food and Beverage will operate the Skimobile Station Legend’s Grille and Zips Pub will also be open. Retail and Rentals will also be open. See you Saturday and check back later in the week for the latest updates!